Most-Trusted Telecom Brand Bharat Sanchar Nigam Limited (BSNL) has Extended Promotional Offer plan announced earlier under GSM Prepaid for both 2G and 3G Mobile Services across Tamilnadu Telecom Circle for limited period. 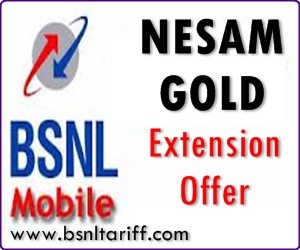 The Competent Authority of Tamilnadu Telecom Circle has Extend promotional plan ‘Nesam Gold’ offer announced earlier, now decided to continue the same offer for a period 7 days under both 2G and 3G Prepaid Mobile Services across Tamilnadu Circle (Including Chennai Telephone District). The above Extension offer with effect from 21-08-2013 to 27-08-2013.